You may download a more detailed explanation of our Upcoming Security Events and Announcements. If you do not already have Acrobat Reader installed on your computer you may download this free easy-to-install tool from the Adobe website. Download Acrobat Reader now. Showing attendees how the application of security solutions must produce behavior modification and effectively impact perception. 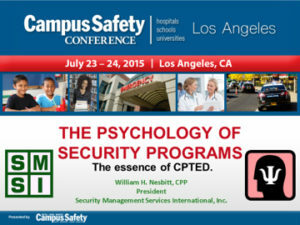 Go to www.campussafetyconference.com. Use the Priority Code SPKR10 to get 10% off full conference pricing. ASIS International Annual Seminar and Exhibits, the most comprehensive and respected show dedicated to security, provides industry professionals with unmatched opportunities to learn about innovative trends and technologies, share knowledge and ideas with visionary leaders, and find the products and services they need, all under one roof. This leading security event attracts more than 23,000 security professionals from across the globe with an exhibit hall hosting 950+ of the leading industry vendors. Go to www.asisonline.org. The International Association for Healthcare Safety and Security is holding its 40th Annual General Meeting in Vancouver this year June 28 - July 2. The program features internationally recognized speakers from both sides of the border discussing topics ranging from "Target Violence in Healthcare"; "Emerging role of Emergency Management and Security in Healthcare"; "Gang Culture from the Streets to the Emergency Department". James Biesterfeld graduated with a B.A. in Education from Concordia University, River Forest, Illinois. After graduation, he joined the U.S. Army, initially as a Military Policeman. Some of his assignments included: Criminal Investigator, Ft. Belvoir, Virginia; Narcotics Investigator with the Joint Drug Suppression Team, Mannheim, Germany; and Commander of the guard, NATO, Giessen, Germany. He was recruited into Military Intelligence as a Special Agent for Counterintelligence, where he was responsible for the investigation of National Security Crimes, including Counter-Espionage and Counter-Terrorism. He is a linguist in the Arabic and German languages. Some of his assignments included: Counterintelligence Activity, Kwajalein Atoll, Marshall Islands; Senior Special Agent, Operations Desert Shield and Desert Storm, Saudi Arabia; and the Discreet Surveillance Detachment, Frankfurt Germany. Space is limited. Please RSVP before Monday, April 20 indicating the company/agency and number of persons attending (names optional). For individuals please provide names and contact information. Dr. Robert J. Meadows, Chair, Criminal Justice and Legal Studies Email: meadows@clunet.edu office: 805.493.3484, fax: 805.493.3479. SMSI Inc. has redesigned and repackaged Virtual Security Management (VSM). Our latest service offering is our Security Management Program Support (SMPS). SMPS is a more comprehensive service that will be adapted to meet the individual needs of each client. SMPS will provide a wide range of professional security management support to security programs that would benefit from improvement and upgrading. These services include unlimited availability to onsite security managers by our team of Board Certified Protection Professionals (CPP) to enable problem solving while continuing to improve the prevention and deterrence component of the security and loss prevention program. RFP development and project management oversight will be provided when the products and services of outside security vendors are being considered. Regular onsite visits will be scheduled predicated on mutually agreed upon needs. The Security Management Support Program’s services will include helping each client develop the security component of the disaster management plan. Every client will be provided with a complete security assessment at a preferred pricing level. SMSI will continue to monitor your security program electronically in order to ensure the security program continues to address emerging trends.